The setup for the final episodes of Breaking Bad. SPOILER ALERT: This article features spoilers from Breaking Bad. If you haven’t seen up to Season 5, Episode 8, you should stop reading. If you haven’t seen Breaking Bad yet, start. After the explosive Season 4 finale of Breaking Bad, I got into a discussion with my friend about where the show would go. That finale seemed like the perfect ending to the longest chapter of the show, and it was hard to know what exactly would happen next. We decided the only was to bring the show full circle was to work out the final showdown of the show: Walt vs. Hank. While Breaking Bad started as a show that clearly revolved around Walter White, chemistry-teacher-turned-meth-cook-battling-cancer, many articles have made the point that Breaking Bad is a show that constantly makes you wonder who is the main character? Sure, the 2nd choice for the main protagonist would be Jesse Pinkman, but Jesse’s real role is moral center of the show: he’s the character that best reflects the feelings of the audience watching the show. He freaks when Walt gets too insane. He walks away after an innocent boy is killed (somewhat) because of him (the same way my dad walked away from the show after that episode because ‘that was a terrible thing to do to someone’). Then there was the argument for Mike as the hero: the ex-cop with a Dexter-like code that he would live by. That was short lived. Finally, there is Hank: a man who has been present since the first episode but is always out of the spotlight. His life and Walt’s life overlap more than Hank could ever know, and at times you see those moments play out from each perspective. In a way, Breaking Bad is telling the story of the good guys vs. the bad guys, very similar to the way The Wire did so. While Walt is being bad, Hank is out on the case, looking to lock up the bad guys, and is committed to making sure that happens. That point is what makes the inevitable showdown between the two of them so exciting. Is Hank’s obsession with the meth case something stronger than the bond with his family? Hank has always been there for his family, but has never been one to stray from police protocol. The finale Sunday night should set up both a great cat and mouse game and an incredible internal struggle for Hank. 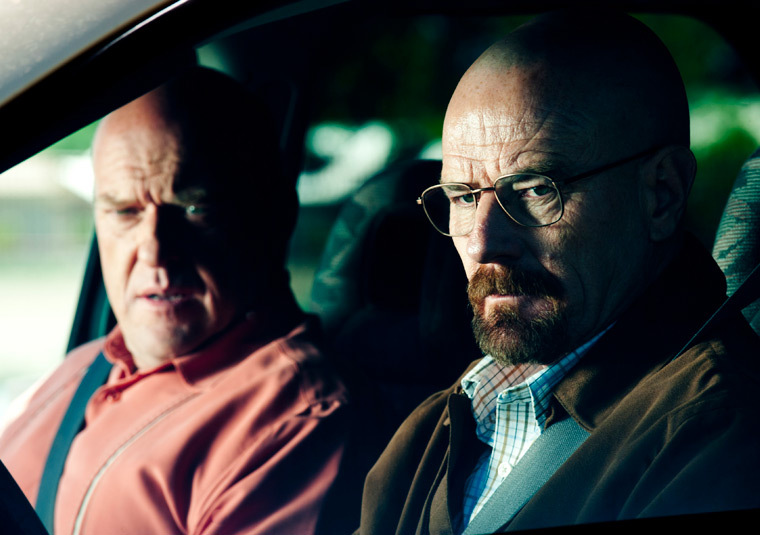 Think of how this could play out: Hank confirms Walt is the kingpin, he struggles with what to do with the information, but ultimately he realizes the two of them have no relation by blood and that Walt should be locked up. Next he figures out Skyler is also involved so he must decide if he’d want the responsibility of leaving their kids parentless. But hey, he and Marie have already been taking care of them. No big deal. Then he realizes that Marie would almost definitely leave him if he locked up her sister. Marie would go back to robbing stores and get arrested. Hank would become an alcoholic. Flynn would have the raise the baby by himself with the secret money Walt left for him. But is all that worth it just to be loyal to the law? Perhaps the greatest part of the ensuing showdown is that there is almost no way Walt would have ended up where he is now if it wasn’t for Hank taking him out for a drug bust during the pilot. Walt would have never gotten the knowledge of dealing meth from Hank and he never would have reconnected with Jesse. The monster that Hank is left staring down is a monster that he gave life to. At the same time, Walt’s empire has indirectly helped the DEA get a done of huge dealers and drug lords off the street – instead there is just one major player left standing. This final showdown, perfectly constructed by Vince Gilligan, could cause a huge divide between viewers. Will they stay loyal to Walt, the one who they’ve followed since day one and still root for even though he’s gone totally evil, or will people follow Hank as he attempts to find a way to catch the biggest drug lord the Southwest has even seen, who just happens to behis brother-in-law? Fine, the supporters of each side may not be as committed to their team as Team Jacob and Edward, but people will choose a side. The exciting part is the person a viewer chooses to side with could say more about the viewer than the characters. Nice one, Vince Gilligan. Nice one.